Andover Organ Company is a group of dedicated artisans who build and restore mechanical action pipe organs. We have built 118 new organs and rebuilt or restored over 500 older instruments. Examples of our work can be found throughout the United States. 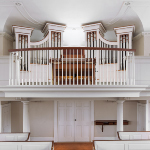 Founded in 1948, as the result of the Organ Reform Movement, Andover has played a pivotal role in the preservation of 19th Century American organs and in the construction of historically informed new instruments which inspire players and listeners. In 1959 Andover built one of the first new tracker organs by a US firm since the 1930s. In 1964 we carried out the world's first re-trackerization of an electrified tracker organ. Along with building, rebuilding and restorations, we maintain over 300 organs throughout the Northeast, Mid-Atlantic and Southeast. With 67 years of experience, we have a reputation for quality work and meticulous craftsmanship. Our employees have collectively a total of over 350 years of organbuilding experience; half of them are church musicians. Andover is a member of the International Society of Organbuilders (ISO) and the Associated Pipe Organ Builders of America (APOBA.) Many of our employees are members of the American Institute of Organbuilders (AIO) and the Organ Historical Society (OHS). Ryan joined Andover full-time in March 2012. For the previous two years, he had assisted us on installations and tuning tours. Ryan began formal musical studies in high school, where he played piano and sang in various choral ensembles. His passion for the organ began at Gettysburg College, where he was an organ student of Josephine Bailey Freund, graduating with a BA in Music in 2002. After taking a detour from music, Ryan returned to the organ bench in 2009 to become Organist and Choir Director at St. George’s Episcopal Church in Durham, NH, where he plays on a ca. 1890 John Sole tracker. Ryan was awarded an Organ Historical Society (OHS) E. Power Biggs Fellowship in 2011 and an American Institute of Organbuilders (AIO) Convention Scholarship in 2013. Matthew joined Andover in 2003, having spent 28 years at Roche Organ Company in Taunton MA, 3 years in Portland, OR with Marceau & Associates and Bond Organ Company, and 2 years with Parson Pipe Organs in Canandaigua, NY. He holds a BA degree from St. Francis College, studied architecture at Pratt Institute and served as a church organist in New York and Massachusetts. He has studied historic organs and architecture in America, England, Europe and Mexico. At Andover, he is a Project Team Leader, works on publicity and sales, and leads the Berkshires-to-Buffalo maintenance team. Matthew is a charter member of the American Institute of Organbuilders (AIO) and holds the AIO Fellow Certificate. He chaired the AIO Education Committee, served on the AIO Board of Directors and recently (2012-2015) as AIO President. He also served on the ISO 1992 Boston Congress committee, co-chaired the OHS 2005 Southeastern Massachusetts Convention and currently chairs the AIO 2016 Boston Convention. Matthew and his wife Lisa first met at the AIO 1979 Boston convention. They live in Haverhill, MA and have a grown daughter. Anne came to Andover in 1983 as secretary. She holds a Bachelor of Science in Computer Information Systems and a Graduate Certificate in Accounting from Southern New Hampshire University. Now Office Manager, she is responsible for HR, bookkeeping, payroll and computer systems. She and her husband Rod have two grown daughters. Michael joined the staff at Andover in 1991. He enjoys designing organs with AutoCAD and leads one of the company's tuning and maintenance teams. In addition, Michael specializes in slider windchests and mechanical key actions. He also serves as Treasurer and Clerk for Andover's Board of Directors. Studying at the New England Conservatory with Yuko Hayashi and William Porter, Michael graduated with a Bachelor of Music degree in Organ Performance. Michael has served as a church musician for nearly 30 years in Massachusetts, New Hampshire and North Carolina. He is currently Organist at the historic Church of the Pilgrimage in Plymouth, MA. Michael lives in Weymouth, MA with his wife Katherine and their children Mary and William. Don joined Andover in 2004 as a voicer specializing in reeds. Before this, he worked as a voicer at the Reuter Organ Co. of Lawrence, KS. He also taught choral music in his native Texas. Don has studied the art of reed voicing with several American and European specialists. His reeds are greatly admired by our tuners for their ability to stay in tune! He has also served many churches as organist/choral director, most notably Grace Episcopal Cathedral in Topeka, KS. Since moving to the Northeast, Don has retired from regular church work and is enjoying substituting in several area churches and simply being a "congregant." He and his partner live in Salem, MA. 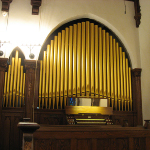 Prior to joining us in January 2013, Andy assisted us in the removal of the Estey organ at First Parish in Bolton, MA, and in the installation our Opus R-489 which replaced it. Andy comes from a musical and mechanical family; both his father and grandfather were piano and clock technicians. At age 7 he helped his father move a Reuben Midmer organ to a local church. While in high school Andy acquired and set up a 1920s Kilgen II/3 as a home practice instrument. He plays piano and organ and studied organ for several semesters at the University of Michigan. He also studied trumpet for 8 years and played in the University of Michigan Marching Band for two seasons. He now plays trumpet in several community bands and at occasional services at First Parish in Bolton. Helping his father with woodworking projects, from house construction to fine cabinetry, Andy grew up with an appreciation for antique machinery and tools. When not driving his parents’ 1937 LaSalle or 1948 Dodge pickup around central Massachusetts and Vermont, he spends his free time at antique shops and auctions looking for good deals on tools and clocks. Lisa has been Andover’s Administrative Assistant since 2002 and now also serves as our Maintenance Coordinator. She is the voice on the other end of the phone when you call us. Lisa grew up in Brattleboro, Vermont, home of the Estey Organ Company. She has been a flutist for twenty-six years and is currently a member of the Merrimack Valley Flute Choir and the Lexington (MA) Bicentennial Band. She also enjoys singing in her church choir. Lisa and her husband Matt live in Nashua, NH, with their calico cat, Princess Jamaica. After a 4 1/2 year stint in the U.S. Navy as a Chaplain’s Yeoman, Ben came to Andover in 1975. Prior to that he received a Master of Music degree in organ from the University of Wisconsin, where he also did a survey of contemporary North American tracker organ builders. He holds a B.A. in Music from Colby College, with a specialty in organ. Ben is President of Andover Organ Company. He is experienced in almost every facet of organ building and leads with quiet competence. He is also Minister of Music at The First Congregational Church, UCC, in Milford, New Hampshire. Ben and his wife Kathy have three grown children. Kevin rejoined Andover in March 2016, having previously worked here for a short time ten years ago. Over the last decade, he did subcontracting work for other organ builders, and operated his own firm for several years. With experience in graphic arts, Kevin also handles the layout and design of Andover's ads and annual newsletter. He serves as Director of Liturgical Music/Organist at Saint Aloysius-Saint Jude Church (RC) in Leicester, MA, a position he has held for 6 years. He is a member of the American Institute of Organbuilders, and in his limited spare time, tunes and repairs pianos. Fay started with Andover as a summer intern in 1979, the last summer the company was in the old shop building. As an organ student at Duke University, she thought it would enhance her work to know more about the instrument. She worked for Andover again during the summer in 1980, and after receiving her B.A. in Music, became a full-time employee in 1981. Fay served for 17 years as our Maintenance Coordinator, and recently returned to production work. Though she misses contact with her “customer-friends,” she is glad to be working on organ parts again. She is an accomplished organ builder and in the shop she has worked in the following areas: pre-voicing pipes; repairing wooden and metal pipes; and restoration work on windchests, cases, reservoirs, wind systems, key action, and pedal coupler action. She and her husband John have two sons. John began working for Andover in 1976. He had previously learned some of the various aspects of organbuilding with G.W.F. Hunt and Charles Hendrickson in his native Minnesota, and at Bozeman-Gibson in New Hampshire. For many years he led a team in the Old Organ Department, having the opportunity to work on some of the finest 19th Century American instruments and gaining much worthwhile experience along the way. Since 1999 he has been Tonal Director for our new instruments, sharing that position with Bob Newton for old organ rebuilds. John leads one of the company’s maintenance teams, covering Maine and the southeastern states. Cooking with smoke is one of his pleasures when he is not at work. Bob, a Vermont native, was a mathematics major at the University of Vermont. He leads the Vermont and Northern New Hampshire maintenance teams and has been in charge of the restoration of several large and important organs, including the 1866 E. & G. G. Hook at Old South Church in Newburyport, MA, and the 1852 E. & G. G. Hook at the Unitarian Church in Bridgewater, MA. He is a nationally-recognized authority on E. & G. G. Hook and Hook and Hastings organs. Bob has served on the National Council of the Organ Historical Society and on several convention committees, most recently the OHS 2013 Vermont Convention. His home is a renovated church in Methuen, MA, where he has collected many antiques and musical instruments. Don Olson serves on Andover’s Board of Directors. He started at Andover in 1962 and held various titles – including Director of the Old Organ Department, Executive Vice President and General Manager - before serving as Andover’s President from 1997 to 2012. He then continued, part-time, working on publicity and sales. Don retired from organbuilding in June 2015, after 53 years with Andover! An avid organic gardener and fan of Wagnerian opera, he volunteers at the Maine Wildlife Park in Gray, Maine. Jon joined us in January 2003 as an apprentice organbuilder. He has had a fascination with musical instruments since early childhood. After attending Tufts University where he majored in Ancient History, Jon decided that he wanted to focus once again on music. He became very active in the harmonica community, learning to repair and work on the mouth organ while forming a close association with some of the best technicians in that field. This encouraged him to consider making musical instruments and to take the leap from the humble mouth organ to the grand pipe organ. For Jon, working on the many historic 19th century organs Andover maintains and restores has been especially rewarding as it incorporates his two great passions of history and music. Jon is primarily serving in pipe and voicing areas, repairing old pipes and preparing new ones. Craig came to Andover in 1994. A native of the Oregon coast, Craig received a Bachelor of Music degree in Organ Performance from Oberlin College. He then moved to the Boston area because of the historic organs. After working many years in electronics manufacturing, and receiving a Master of Science in Electronics Engineering from Boston University, he decided to pursue his love of music, and joined our team. He specializes in electrical systems design and wiring, but is also a maintenance supervisor. Craig lives with his wife, Cathie, and their two children in Tewksbury, MA. He has been treasurer for the Merrimack Valley Chapter of the AGO for several years, and is currently Organist/Music Director at St. Andrew’s Episcopal Church in Methuen, MA. David joined our team of skilled craftsmen in 2000. He has experience as a cabinet maker, building custom wooden furniture, as a model maker for Seth Thomas Grandfather Clocks, and as a pattern maker for ferrous metal castings. Prior to his arrival at Andover, David worked for ten years as an organbuilder with Bozeman Organ Co. David’s responsibilities at Andover include casework, wind chests, consoles, and wood pipe construction. David and his wife, Debbie, live in NH and have three grown children and one grandson. In his leisure time, David enjoys woodcarving and spending time with his family - especially his grandson Asher! He also enjoys hiking, camping, canoeing, visiting the White Mountains, and gardening. Visit our FACEBOOK page to see what's new! CLICK HERE to read the online version of Andover's 2018 Newsletter. To commemorate our 70th anniversary, Matthew Bellocchio has written a detailed history of the company, its key people, and its innovative work, which appeared as the cover feature in the June 2018 issue of The Diapason. CLICK HERE to see this illustrated article. Katelyn Emerson's stunning recording of our Opus 114 in Baltimore, MD is now available at the ProOrgano website. CLICK HERE to purchase the CD. CLICK HERE to download the MP3 version. Katelyn Emerson has recorded her second Pro Organo CD album, “Inspirations”, on Andover Opus 114 at Christ Lutheran Church in Baltimore. The album features works by Rheinberger, Buxtehude, Parker, Bairstow, Daquin, Langlais, Duruflé and Lauren. CLICK HERE for the preview video, in which she plays excerpts from the Rheinberger Passacaglia (Sonata 8, Op.132) and Rachel Laurin's Finale, Op.78. Our recent rebuilding of the 1853 Simmons organ at First Parish in Duxbury, MA is the cover feature article in the May 2018 issue of The American Organist, the national magazine of the American Guild of Organists. CLICK HERE to read the article. CLICK HERE to read the online version of Andover's 2017 Newsletter. Raven Compact Discs has released Volume 5 of Bruce Steven's series of the Rheinberger organ sonatas. The disc features three sonatas (No.7 in F minor, No.9 in B minor, No.13 in E-Flat Major) played on three historic American organs: the 1860 E. & G.G. Hook at St. John's Catholic Church in Bangor, Maine; the 1898 Geo. Jardine & Son at St. Peter's Catholic Church in Haverstraw, New York; and the 1868 E. & G.G. Hook at Christ Episcopal Church in Charlottesville, Virginia. CLICK HERE for more information. Andover restored the latter two instruments and cares for all three. CLICK HERE to read the online version of Andover's 2016 Newsletter. On January 11, 2017 the 3 manual 1847 Davis & Ferris Organ in the Round Lake (NY) Auditorium was officially designated a National Historic Landmark by the U.S. Secretary of the Interior. It is the first pipe organ to receive this designation. Andover has maintained the organ since the 1960s. Andover has been contracted to restore the 1906 Jesse Woodberry organ at St. Patrick’s Church in Lowell, MA. With 3 manuals and 56 ranks, it is the largest organ built by Woodberry, and the largest surviving pipe organ in the City of Lowell. The instrument has been unplayable for nearly a decade. The project will be done in three stages (Console & Choir; Swell; Great & Pedal) over three years, starting this spring, with completion by early 2020. Opus R-500, at Saint John's Seminary in Brighton, is the cover feature article in the October 2015 issue of The American Organist, the national magazine of the American Guild of Organists. CLICK HERE to read the article about the rebuilding of the organ. CLICK HERE to read the online version of Andover's 2015 Newsletter. 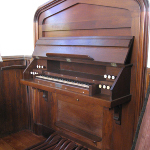 In 2013 we restored the 1895 (II/9) Hutchings organ at First Parish Church of Stow and Acton in Stow, MA. A church member made a stop-action video of Jonathan Ross and Andrew Hagberg reinstalling the pipework. Click here to see the video.